One thing about the French: they know how to eat. Not only do they take their time at meals, lingering over each course, drinking water, sipping wine, and finishing with espresso, but the ingredients are fresh and local and the preparation superb. 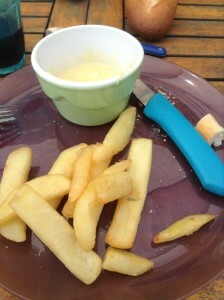 Even the most mundane dish–French fries, or “frites,” as they’re called in France–taste better. 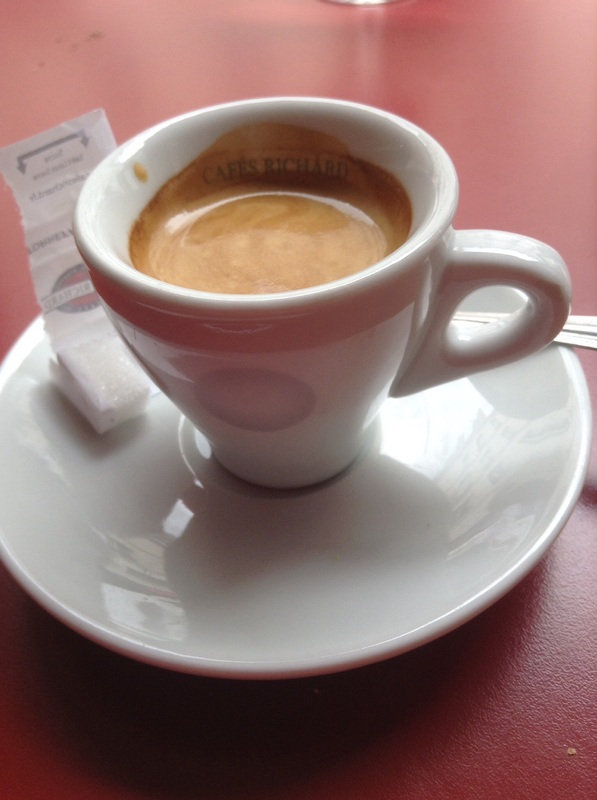 I don’t know if France has the equivalent of Sysco or Food Services of America providing processed foods to restaurants, but I’d be willing to bet against it. French food is fresh food! 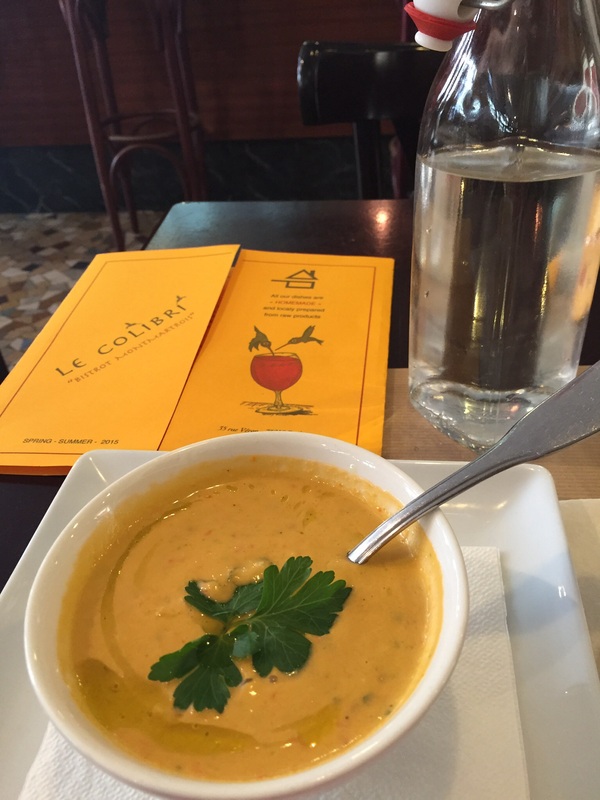 Roasted tomato gazpacho: This delectable chilled, pureed soup from Le Colibri in Montmartre made me want to lick the bowl. 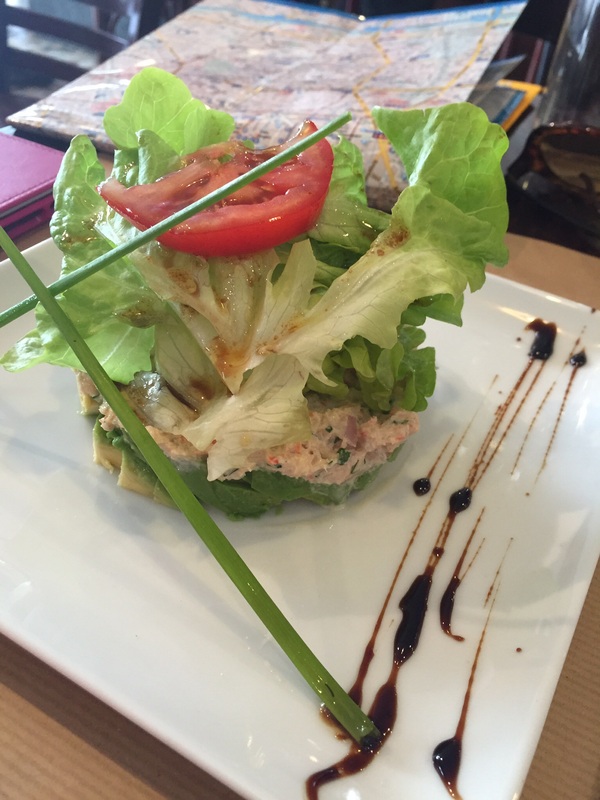 Real crabmeat mixed with chopped avocado and a light dressing, topped with lettuce and tomato, a perfect cold dish on an unseasonably hot Paris day. Also at Le Colibri, an unpretentious and inexpensive Montmartre café where the locals eat. 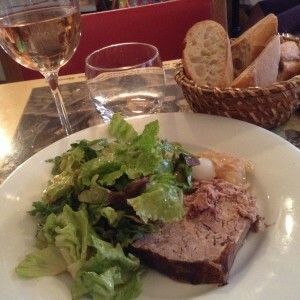 Country pate came with caramelized onions, a green salad and a basket of bread — delicious and a great bargain for 13 euros at Le Petit Parisien, also in Montmartre. 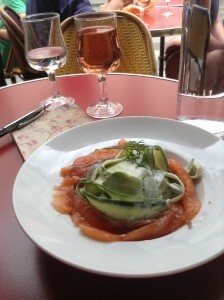 Smoked salmon with cucumber “tagliatelle” and a delicious cream sauce, so good with a class of rose wine at Café du Commerce, another unpretentious haunt for locals on the Rue de Clignancourt. 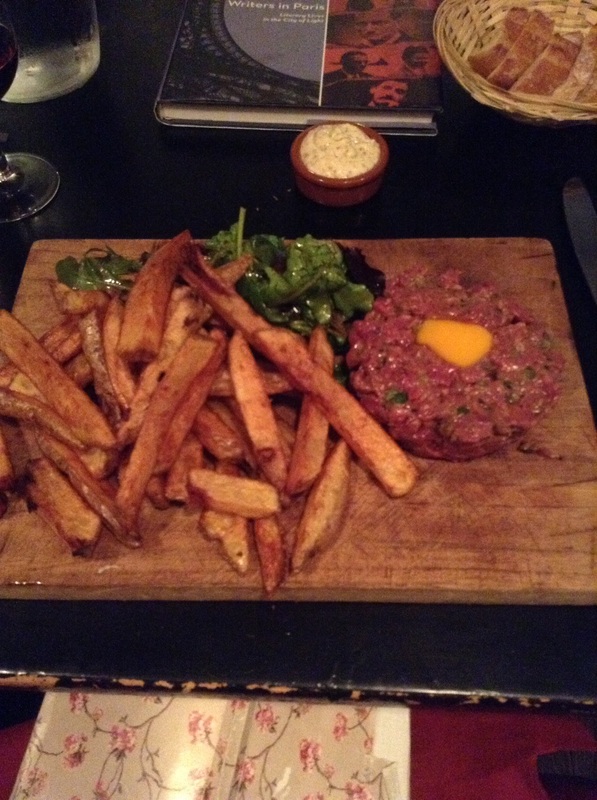 Beef tartare–yep, that’s raw, chopped beef mixed with things like capers and other tasty ingredients, served with a raw egg in the center and fries at La Balancoire in Montmartre. I devoured every morsel. No visit to Paris would be complete, gastronomically speaking, without a Croque Monsieur, the signature sandwich, made with ham, cheese, and béchamel sauce, and toasted. 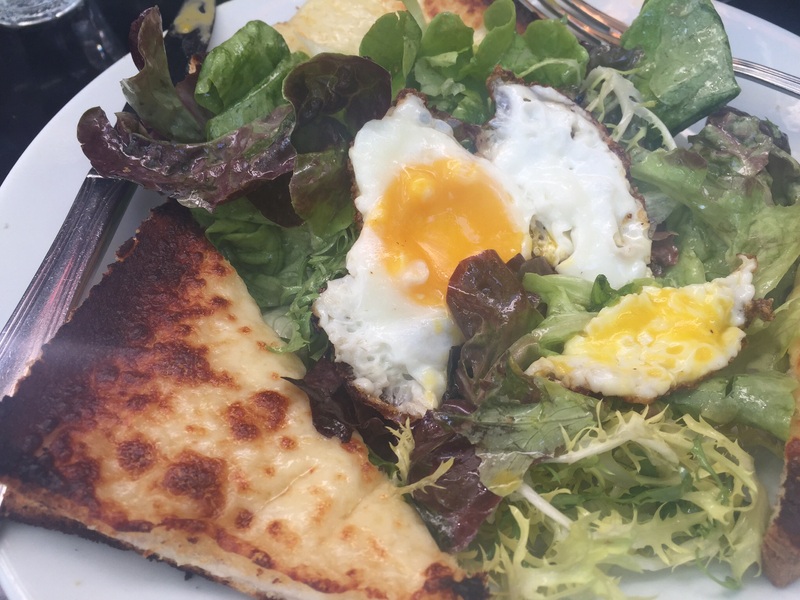 I had the Croque Madame, which comes with an egg. 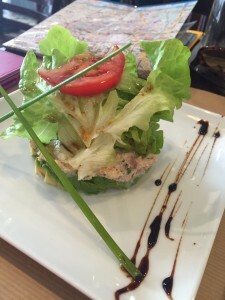 The French almost always have salad as a part of their meal. 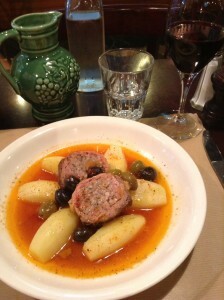 I ate this at a so-so café that seems oriented toward tourists, and yet it tasted better than any Croque Monsieur or Madame I’ve had in the U.S.
Veal croquettes served with little boiled potatoes, whole olives, and a tasty sauce, again at Le Colibri, where a 50-cl carafe of good peppery Gamay wine cost me 10 euros. 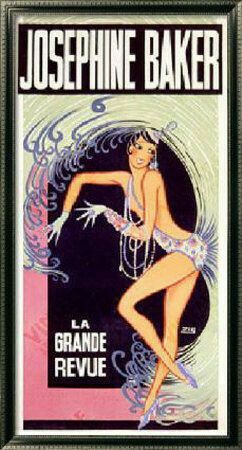 Filling my glass four times, it also had me staggering home! In Creuse, my hosts treated me to “Frites Creusoises,” crunchy fries with a dipping sauce of melted cheese. Yum! 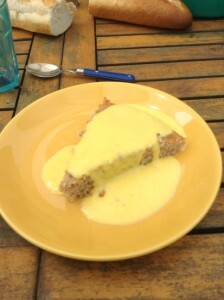 Dessert, anyone? 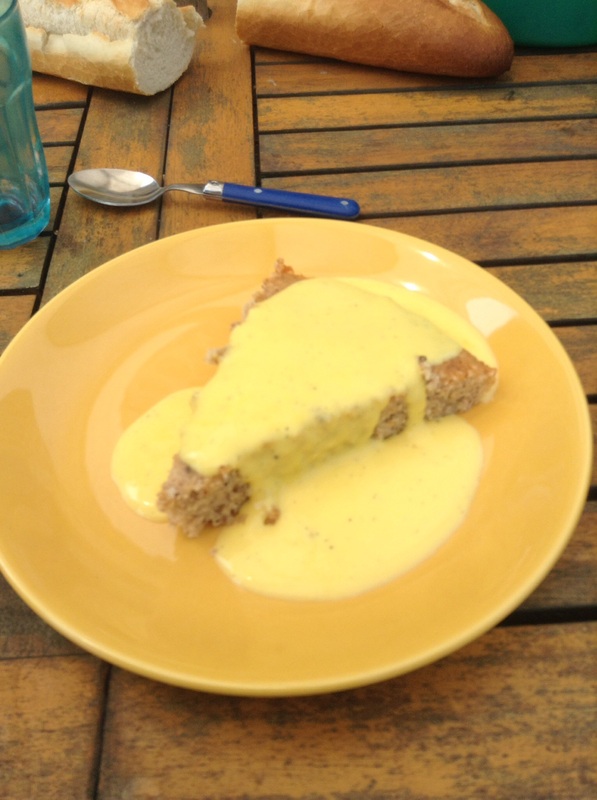 I don’t often indulge, especially if the offering isn’t chocolate, but I couldn’t resist this regional delicacy, a hazelnut cake with crème anglaise.